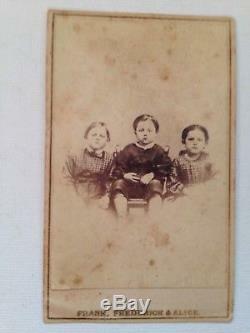 Nice original copy of this famous photograph of the 3 children of Sergt. Amos Humiston of the 154th N. Wenderoth & Taylor of Philadelphia backmark. 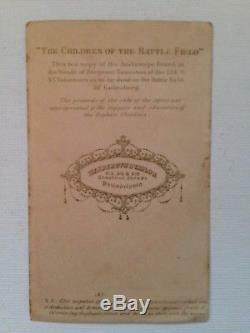 The item "The Children of the Battlefield Civil War CDV Frank, Frederick & Alice HUMISTON" is in sale since Saturday, April 14, 2018. This item is in the category "Collectibles\Militaria\Civil War (1861-65)\Original Period Items\Photographs". The seller is "thomaspub-bullets" and is located in Fairfield, Pennsylvania. This item can be shipped to United States.